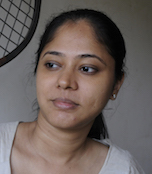 Shilpa Gupta was born in 1976 in Mumbai. In 1997 she received her degree in B. F. A. (Sculpture) from Sir J. J. School of Fine Art, Mumbai. In 2004 Shilpa was awarded as International Artist of the Year at the South Asian Visual Artists Collective of Canada and she received the prestigious Transmediale Award in Berlin and the Sanskriti Prathisthan Award in New Delhi. In 2011 she participated in a group exhibition at the Pompidou Centre, Paris. In 2012 she had a solo exhibition at ZKM Media Museum, Karlsruhe. From 1996 - 2016 Shilpa has had numerous solo and group exhibitions all around the world. She participated in the Gwangju Biennale, Korea and the International Biennale of Contemporary Art of Sevilla. She participated in the International Triennale of Yokohama, Japan.